BACKGROUND AND SETTING: The global food price surge of 2006 to 2008 has negatively impacted South African households. Rising food prices adversely affect food security in South Africa. The ever-increasing prices for food commodities and lack of access to finance make it very difficult to strengthen food security amongst households in South Africa. AIM: The aim of the study is to examine the impact of food prices on household welfare in South Africa. Additionally, the study attempts to analyse the short- and long-run relationship between food prices and household welfare in South Africa. This is done by determining how real household welfare responds and/or reacts whenever there is a shock in food prices and its fundamental determinants. Finally, the study attempts to distil recommendations toward a conceptual framework for the mitigation of the impact of high food prices on households in South Africa. METHOD: The Vector Error Correction Modelling (VECM) technique is utilised to estimate a regression model. RESULTS: The results reveal that a 1% increase in food prices would reduce household welfare by 21.3%. The study, therefore, confirms a negative correlation between food prices and welfare. CONCLUSION: Short-run policy recommendations include: (1) subsidising staple food baskets for households in South Africa, (2) reducing prices of staple foods through the reduction of food tariffs and (3) reducing household expenditure on basic needs through subsidisation. These policy options could lessen the burden on households when there is a rise in the prices of staple food sources and therefore improve household welfare. Long-run policy recommendations include: (1) improving the unemployment rate in South Africa and (2) improving access to finance and credit for South African households. By addressing the rising unemployment rates and improving access to finance and credit in South Africa through job creation initiatives and improving micro-credit strategies, an environment can be created where households improve their disposable income. Rising food prices have an adverse effect on food security in South Africa. The literature thus suggests that food insecurity has been a major contributing factor to poverty in South Africa (Bonti-Ankomah 2001; Du Toit 2011; Van der Merwe 2011). The global and national food price surge of 2006 to 2008 had a negative impact on South African households. According to Maunder and Wiggins (2007), rising food prices came at a time when South Africa was experiencing a chronic food security crisis and the population was extremely vulnerable to food insecurity. The ever increasing prices of food commodities and the lack of access to finance make it very difficult to strengthen food security among households in South Africa. To examine the relationship between food prices and household welfare in South Africa by determining how real household welfare responds/reacts whenever there is a shock in food prices and its fundamental determinants. To analyse the long-run relationship between food prices and household welfare in South Africa by determining how real household welfare responds/reacts whenever there is a shock in food prices and its fundamental determinants. To distil recommendations toward a conceptual framework for the mitigation of the impact of high food prices on households in South Africa. Clarity on the causes of market failure by policymakers is important. Von Braun, Teklu and Webb (1993:76) stated that it was critical for the government to have an encompassing knowledge of the correlation between market and price behaviour in times of food crises. The government is the custodian of policymaking and implementation and thus needs to support remedial action in order to address the welfare impacts of rising food prices. Rocha (2006:5) argues that food insecurity should be included as a market failure, as it occurs when free markets are seen to be socially inefficient, when the market outcomes prove social benefits to be below the costs of society in respect of that outcome, or when benefits are not fully utilised via social resources. Hence, the market clearing variables do not maximise net social benefits (Kahn 1998:14). The presence of public goods and of negative externalities are the two most important causes of market failure in food security. The relationship between relative and nominal prices forms the causal nature of changes in food prices and can be attributed to relative demand and supply conditions of both non-food and food commodities, resulting in a net increase in relative food prices (Belongia 1983:5). Rising food prices increase the risk faced by lower-income households and subsequently transfers real income from lower-income consumers (Newbery 1989). Rising food prices have an adverse effect on purchasing power. Poor households spend the majority of their household income on food, making food prices an important factor in the well-being of the poor (Pinstrup-Andersen 1985:69). Hence, the changes in price of food commodities influence the ability of households to purchase food items (Jacobs 2009:413). Rising food prices consist of a combination of variables influencing the welfare of the poor. Factors such as supply and demand, inventories, macroeconomic factors, exchange and interest rates, global economic activity, oil price volatility, global weather patterns, financial investment and agricultural policy all attribute to the volatility of food prices (Roache 2010). Prices of food commodities continue to increase over time, leaving the poor vulnerable to food insecurity. A study done by the Food and Agriculture Organization of the United Nations in 2008 indicated that global nominal prices of all major food sources were at their highest levels in 50 years and continue to increase (Reyes et al. 2009:1). The poor are vulnerable to food price hikes, but policymakers can alleviate the burden suffered by the poor. Karfakis, Velazco and Covarrubias (2011:3) stated that approximately 70% of the global poor population reside in rural areas and are dependent on agriculture for the possibility of improving their livelihoods, welfare and decreasing poverty rates. South African urban households spend more toward food than do rural households. As demonstrated by Bonti-Ankomah (2001), rural households' food expenditure is approximately 23% of their total household spending at R588.00 whereas urban households spend approximately 15% of their household expenditure at R945.00. The difference between urban and rural food expenditure can be expected, as rural households may supplement spending toward food by subsistence farming or own food production. There is diversity in the international empirical evidence that relates to food prices across the globe, with clear distinctions from country to country. In order to evaluate the impact of food prices on household welfare clearly and effectively in South Africa, it is crucial to understand how other countries have responded to the same impacts and the effectiveness of their reforms. The literature discusses the experience and reforms of three countries: Ghana, India and the USA. These countries differ in terms of income distribution, poverty levels and food security. However, each country has developed policy reforms and programmes to enhance food security and the welfare impact associated with food prices. In 2008, Ghana imposed import duties on yellow corn, rice and wheat in an effort to lessen the burden on consumers from the adverse impacts of further rising food prices (Osei-Asare & Eghan 2014:28). However, a study in Ghana suggested that the current policy reform of protecting domestic rice producers by means of import taxation did not contribute to the reduction of national poverty, as there is a tendency for rice growers in Ghana to remain poor (Minot & Dewina 2013:v). It is challenging for Ghana's government to implement an effective policy due to tight market conditions for important agricultural commodities. For the government to make the correct policy decisions, an understanding of the causes of rising food prices, the implications of future rising food prices and how members of society are impacted by these effects is necessary (Organisation for Economic Co-operation and Development 2008:2). The understanding of these variables allows governments to improve decision-making which contributes to effective policy formation. India has one of the highest rates of rising food prices among the developing economies. According to Bhattacharya and Gupta (2015:2), during the period of 2006 to 2013, India experienced food inflation at an average rate greater than 9%, which was nearly double than the previous decade. Given that the rural poor households in India spend large portions of their total income toward food commodities, they are unable to divert additional resources to suppress the impact of rising food prices, thus strengthening food insecurity in the country. Three patterns can be distinguished in India's food price trends as compared to global food price trends. According to Dev (2009:3), when global food prices increased in 2005 to 2007, the first pattern of inflated food prices emerged. The rate at which food prices were inflated was a lot lower in India at the time. The second pattern saw India's food prices decrease during 2007-2008 when compared to 2006-2007, which is when global food prices significantly increased. The third pattern illustrated that global food prices declined at the end of 2008, but India's food prices escalated during this time, which was an indication that global food price increases had a marginal impact on India due to less exposure. The Indian government adopts a wide range of policy instruments to combat rising food prices. In 2007-2008, the Indian government arranged its intervention measures into two groups: first, economic policies, which included pricing policies, trade policies, stock management policy and public distribution; and second, social programmes. The social programme policy instruments included cash transfers, food for work, food rationing, school feeding schemes and rural employment schemes. The programmes and policies targeted trade and consumption, with little emphasis on a supply response. According to the World Bank (2010), high rising food prices turned the political economy of food into an important catalyst for short-term economic policy in South Asia and highlighted the transformation of food security into an important strategic tool for policymakers. The USA is heavily reliant on food subsidies and tariffs for food security. Empirical evidence illustrates that more than 22% of children living in the USA live below the official poverty line and half will be on food stamps before they reach the age of 20 years (Kairos 2015). Food subsidies are included in price supports by the government, which guaranteed a price for a farmer's crops, whereby the state would purchase the excess crops. The USA Farm Bill of 2002 introduced payments for certain crops which are independent of price, also known as direct payments. The USA has experienced lower food tariffs on fruit and vegetable imports and also experienced higher tariffs from food-exporting countries around the world, resulting in the fact that export growth for the USA did not keep pace with import growth (Johnson 2014:5). The increase in imposed tariffs could have an effect on food prices, and thereby impact the food security and welfare of citizens of the USA. Market information is a key factor when trying to correct price instability, especially in food markets. According to Keech, Munger and Simon (2012:8), without market data on the value of the damage caused by price hikes to markets, the state cannot determine its effects on households and thus lacks credible data and information. Literature detailing the causal relationship between increases in food prices and the adverse impact on households represents varying opinions. A number of empirical studies have indicated that there is a positive correlation between the increase in the price of food commodities and adverse welfare effects on the poor. However, there is also empirical literature that indicates that long-term price increases assist in agricultural development, which in turn impacts positively on employment and brings poverty relief. Jacobs (2009:413) suggests that the poorer households cope with rising food prices by reducing their purchases of food items and changing their consumption behaviour, which could change a household's status from one that is food secure to one that is not. Literature also confirms that prices in agricultural food markets are much more inclined to volatility than in other industries. This is due to the supply of food commodities being inelastic in the short term, the demand for food being price inelastic and the unpredictability of food supply due to climate changes (Pettinger 2014). In 2008, South Africa had a projected total transfer cost, inclusive of agricultural subsidies, of between 2% and 4.5% (Demeke, Pangrazio & Maetz 2009:21). This is a substantial proportion of gross domestic profit (GDP) allocated to assisting the burden suffered by the poor. However, the literature suggests that approximately 80% of South African rural households are unable to afford a basic nutritional basket of food, which would cost approximately R262.00 per month per person on average (Altman, Hart & Jacobs 2009:351). A study done by Aliber (2009:397), using Engel's Law, established that the total share of expenditure on food is higher the poorer the household is. In Mexico, a similar study indicated that changes in local food prices from the beginning of 2005 to the end of 2007 proposed a 1.7% rise in extreme poverty in rural households (Wood et al. 2011:78). Recent studies have shown that policymakers are making strides with innovative mechanisms and legislation to accommodate rising food prices. Policymakers should implement demographical or geographical targeting in order to direct limited resources to households whose welfare is largely impacted by food price shocks (Rodriguez-Takeuchi & Imai 2013:233). The current economic environment indicates sharp increases in food prices. Policymakers have attempted to lower food prices, while also limiting the signalling of higher global prices to domestic markets. Governments across the world have tried to formulate policies and legislation to overcome the adverse effects of food price hikes. Galtier (2009:2) states that since the 1980s, governments have tried to manage risks without affecting prices of food commodities, which affect a host of variables such as crop insurance and future markets, as well as influencing trade behaviour of food commodities. There is a desperate need for government intervention to curb seasonal food insecurity that affects the rural poor by deepening and widening social safety net programmes (Akter & Basher 2014:161). Policymakers require strong legislation and policy to assist the poor in the face of the adverse effects of food price increases. According to Gouel (2013:1), the state must intervene when there is a lack of credibility in food market liberalisation due to a shortage of effective policy to protect the poor. The current policy barriers are the challenges regarding policy design that will build confidence in global markets and develop positive relationships between private and public agents. A deductive and/or inferential approach to research was used in this study, making use of a variety of literature concerning food security and insecurity aspects, especially regarding food price increases. Further, the Vector Error Correction Modelling (VECM) technique was utilised to estimate a regression model. The VECM technique is known to be advantageous over the Ordinary Least Square and the Generalised Methods of Moments techniques, since it analyses both the short- and long-run relationship between variables. It is also well suited to handle the problem of endogeneity in the model. 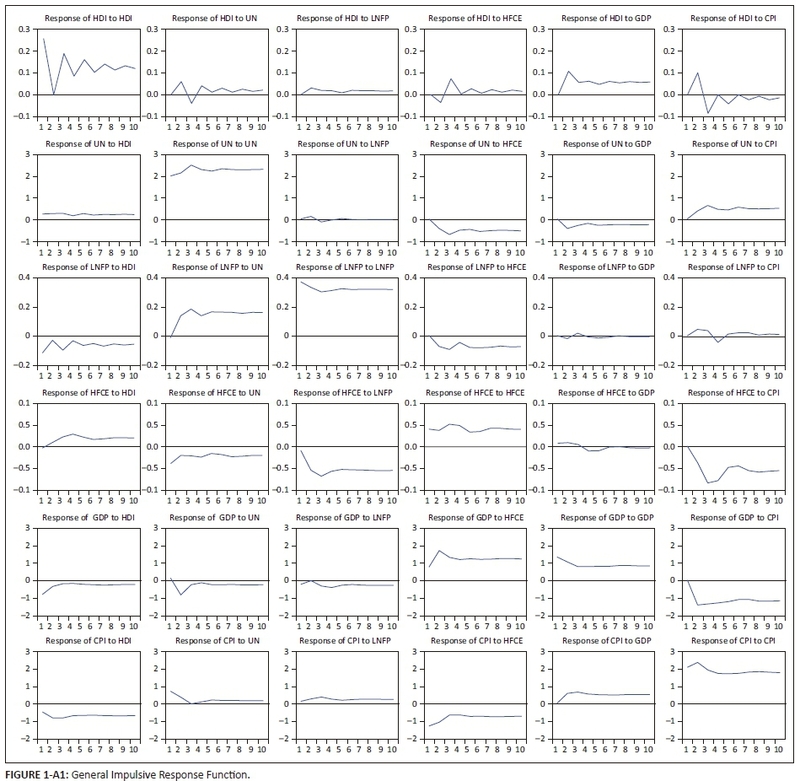 The study employed annual time series data derived from secondary sources such as the World Bank and the Organisation for Economic Co-operation and Development, covering the period 1990-2015. 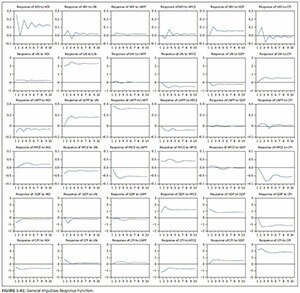 Since time series data is more concerned with ordering and listing of observations as the dependency, it offered this study several advantages over studies that use quarterly and monthly data. Due to the lack of welfare measurement in South Africa, the study employs household disposable income as a proxy. Furthermore, the study incorporates variables such as household final consumption expenditure, food prices, consumer price index and unemployment. All the variables in exception of food prices are collected in percentages and are not subjected to the natural logarithm since it would yield biased estimation. The study employs the VECM approach quantified under the Vector Auto-Regressive (VAR) framework. This study adopted a quantitative nature since it produces descriptive data and, from an econometrics point of view, it is essential to utilise statistical packages such as the E-views 9 package which was utilised for the analysis. The VECM technique incorporates procedures such as testing variables for an order of integration, using the Augmented Dickey Fuller (ADF) and Phillip Perron (PP) methods, determining the maximum lag length, and assessing the long-run association between variables using the Johansen cointegration technique in the estimation of both the short- and long-run relationships. Subsequent to the long- and short-run estimations, the study performed the stability and diagnostic test, using techniques such as the Jarque-Bera test of normality, the White heteroskedasticity test and the Breusch-Godfrey LM (Lagrange multiplier) test of serial correlation. Furthermore, the study performed the variance decomposition and General Impulsive Response Function to detect the behaviour of shocks in the variables employed toward household welfare in South Africa. The study employed the VECM econometric approach to analyse the relationship between household welfare and food prices in South Africa. The VECM technique requires that the data be tested for stationarity or order of integration. The study adopted the ADF and PP test of unit roots. Table 1 demonstrates that when the ADF test is applied to variables at first difference, that none of the variables are stationary at 1%, 5% and 10% level of significance. As a result, the study fails to accept the null hypothesis of non-stationarity and concludes that variables are stationary and integrated at order I (see Eqn 1). According to Philip-Perron, Table 2 tests the variables at first difference. All variables are stationary at 1%, 5% and 10% level of significance. The variables are tested at same models, which are Trend and Intercept, Intercept and None. Therefore, the study fails to accept the null hypothesis of non-stationarity and concludes that the variables are integrated at the same order of I (Eqn 1). 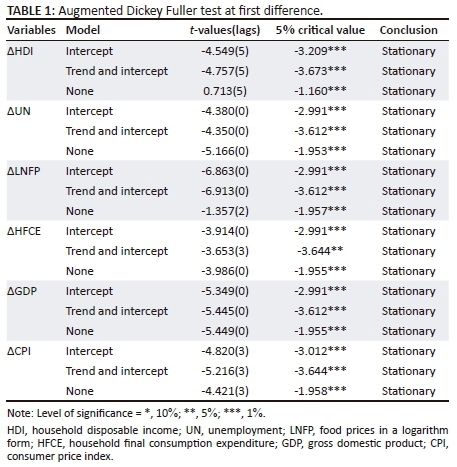 Since there was evidence of stationarity in the variables, the study therefore proceeds estimating a non-spurious model of food prices and welfare impacts for South African households. It is vitally important to conduct a lag length selection criterion to establish the number of lag to use. The lag selection can be done on the basis of Final Prediction Error (FPE), Akaike Information Criteria (AIC), Schwartz Bayesian Information Criteria (SBIC), and Hanna and Quinn Information Criteria (HQIC). The test was conducted and a lag of 2 was selected as reflected in Table 3. The lag of 2 was selected based on the Final Prediction Error (FPE), Akaike Information Criteria (AIC) and, Hanna and Quinn (HQ) results and it is used throughout the analysis of the study. A cointegration test is essential in examining the long-run economic equilibrium relationship between variable X and variable Y. Therefore this study employs the Johansen Maximum Likelihood Estimation process because of its ability to test for multiple cointegrating vectors. The procedure also permits for testing both restricted and unrestricted forms of cointegrating vectors and the speed of adjustment parameters. Where T is the sample size and λ is the ith largest canonical correlation. The Trace test results as reflected in Table 4 suggest that there is one cointegrating equation. The results obtained show that in the case of the trace test, the null hypothesis of no cointegrating equation is rejected since the test statistics of 96.844 are greater than the 5% critical value of 95.753 at none. This was a clear indication that there was one cointegrating equation at the 5% level. 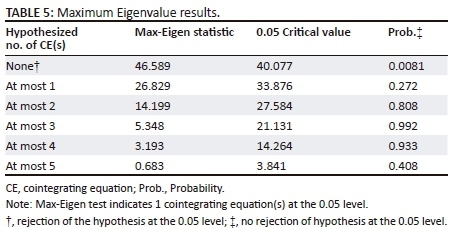 The Maximum Eigenvalue test in Table 5 also indicated that at none, the Maximum Eigenvalue statistics of 46.589 are greater than the critical value of 40.078. As a result, the Maximum Eigenvalue also suggested one cointegrating equation at the 5% level. Since both trace test and Maximum Eigenvalue suggest one cointegrating equation, the study fails to accept the null hypothesis of no cointegration. This concludes that there is a long-run relationship among the variables. The study estimated a VECM to capture both the long- and the short-run effect between the variables. The relationship reflected in Table 6 can be presented in a linear form as follows: HDIt= −197.761 - 0.054UNt - 21.318LNFPt - 1.481HFCEt + 0.516GDPt - 0.389CPIt+εt. The long-run relationship between the variables as explained in the above equation suggested that there was a negative long-run insignificant relationship between UN and HDI in South Africa. The study also proved a long-run negative relationship of LNFP, HFCE and CPI toward HDI and a long-run positive relationship between GDP and HDI. All explanatory variables in exception of UN and GDP were statistically significant in explaining the dependent variable since they have absolutely had a t-value greater than two. The implication of the negative relationship between UN and HDI was that a 1% increase in UN would deteriorate HDI by 0.05% in South Africa. Furthermore, a 1% increase in LNFP, HFCE and CPI would also reduce HDI by 21.3%, 1.5% and 0.4%, respectively. GDP is found to be positively correlated with HDI since it is observed that 1% increase would improve the HDI by 0.5%. As indicated in Table 7 below, the coefficient of the depended variable is −0.071 and is statistically significant with a t-value of −2.045. This suggests that about 7% of the variation in the real GDP from its equilibrium level is correlated within a year. Based on this result, the adjustment of the GDP to restore long-run equilibrium is weak at 7% per annum. It is traditional to interpret the VARs using the Impulsive Response Function (IRFs). According to Sims (1980), the IRFs are useful in the VAR framework since they allow for tracing out the time path of the numerous shocks on the variables. Plotting the IRF is a useful technique for visual representation of the behaviour of the series in response to the various shocks. Mujuta (2013) pointed out that impulse responses trace out the response of the present and forthcoming value of one VAR error, assuming that this error returns to zero following periods and that all other errors are contemporaries to zero. In the estimation, IRFs are used to interpret results because it is very difficult to use individual coefficients, as was stated by Bjonness (2012). The study applied the General Impulsive Response Function to trace the magnitude of one-time shock to one of the innovations on the present and forthcoming values of the endogenous variables. The General Impulsive Response Function over the 10 years for the VECM estimation is shown in Appendix 1. Results in Appendix 1 suggest that HDI responds positively to the impulse coming from itself, LNFP and GDP throughout the period of 10 years. Furthermore, it responds negatively to impulse coming from CPI starting from period 3 until period 10. The impulse coming from UN, HFCE were fluctuating between negative and positive toward HDI. The study therefore concludes that household disposable income responds positively to shocks coming from food prices. The results of the VECM estimation reveal that a short- and long-run relationship exists between food prices and household welfare in South Africa. 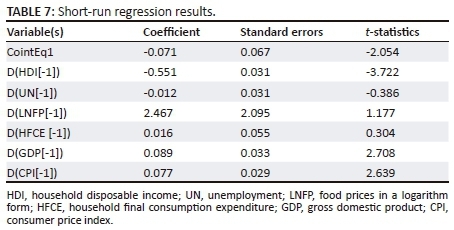 Similar findings by Galtier (2009) reveal that rising food prices have short- and long-run effects on household welfare. The results of this article reveal that rising food prices negatively affect the welfare of households in South Africa and, similarly, a study completed by Mackinnon (1998) acknowledges the decline in household welfare that occurred in Ethiopia during 1984 and 1985 due to excessive increases in food prices. A similar proxy used in a study conducted in India by De Janvry and Sadoulet (2010), who utilised changes in real income as the first estimate to changes in welfare of households. This indicated a money-metric loss in welfare, caused by changes in income and consumption prices. The study confirmed similar findings similar to those of this article, where rising food prices negatively affected household welfare (De Janvry & Sadoulet 2010). The study by Schreitter (2016) suggested that heterogeneity tests had indicated that the correlation between food prices and household welfare was even lower for poor households. The theory and analysis were strengthened by a study undertaken Alem and Soderbom (2012:146) who also conducted research in Ethiopia related to the impact of rising food prices on household welfare and suggested that welfare of the poor living in Ethiopia was sensitive to food price changes. The VECM estimation results were in agreement with the both studies done by Schreitter (2016) and Alem and Soderbom (2012), namely, that poorer households were adversely affected by rising food prices. The study also revealed a strong positive correlation between food prices and household welfare and further, that there was a strong negative impact on household welfare when food prices increased. A similar outcome was obtained in a study completed by Adom (2013), which concentrated on the microeconomic impacts of rising food prices and assessed the potential welfare effects of increasing food prices on households residing in Ghana. 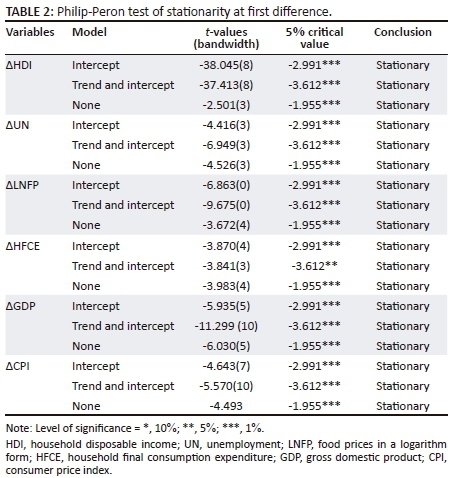 The study adopted the Vector Error Correction Modelling procedures to answer the question whether food prices had an impact on household welfare in South Africa and analysed the behaviour of variables such as unemployment, household final consumption expenditure, food prices and the CPI toward household welfare. The cointegration analysis confirmed a long-run relationship among variables. A significant negative relationship between food prices and household welfare was discovered, which implied that an increase in food prices would result in household welfare reduction in South Africa. The short-run model estimated revealed convergence toward equilibrium in the long-run, although the adjustment was weak at 7% per annum. The results confirmed that the model did not suffer from heteroskedasticity, serial correlation and normality challenges. The polynomial test confirmed the stability of the model since all AR polynomial had roots with a modulus which were <1 and they lay within the unit circle. Based on the above results, this study concludes that food prices are detrimental to household welfare in South Africa. These results are believed to be efficient and consistent, based on the diagnostic and stability test undertaken. The welfare impacts on South African households have largely been negative when there were increases in food prices. The study revealed that a short- and long-run relationship exists between food prices and household welfare in South Africa through determining the response of real household welfare when a shock in food prices occurred. Confirmation of a largely negative correlation between food prices and household welfare was revealed, which found that household welfare declined when there was a rise in food prices in South Africa. The study implies that an increase in food prices results in a reduction of household welfare in South Africa and the results revealed that household welfare responded to shocks in food prices. Reducing household expenditure on basic needs through subsidisation. Improving access to finance and credit. Reduction of total household expenditure. However, through fiscal constraint, the government is hesitant to engage in projects that will take up large amounts of fiscal resources. Agriculture and food security are, however, government priorities and are prioritised within the National Development Plan. Hence the recommendations of this research provide a provisional strategy toward creating an environment for sustainable food prices in South Africa. Further research on creating sustainable food prices in South Africa is necessary to reduce the implications on household welfare in South Africa, especially the poor. R.B.v.W. is the corresponding author and C.S.D. reviewed and supervised the first author in writing this article.